Dionaea muscipula 'Crispy sun' is quite a sight to behold! Its leaves have rows of large, bright red teeth that interlock and mesh together when the trap snaps shut. Every leaf is different giving the plant its fascinating appearance. Dionaea muscipula 'Crispy sun' has broad leaf stalks capable of absorbing a large amount of sunlight or artificial light. 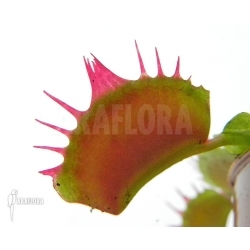 Light stimulates the growth of strong new leaves and teeth which range in colour from red to deep pink. Dionaea muscipula 'Crispy sun' can never have too much light. As a house plant it will grow best in a sunny spot such as on a window ledge. The growing medium needs to be kept wet at all times with rainwater, boiled water or demineralised water but not tap water. It will also do well as an exotic garden plant when positioned close to a water feature such as a pond, in a humid and sunny position.